Address: Fatehabad Road, Agra-282001 (U.P. ), India. Access: 8 kms. from Agra Airport; 4 kms. from Agra Cantt Railway Station;2 kms. from Idgah Agra Bus Stand. Facilities: Standard rooms with room facilities such as attached baths, TV, Radio, C.T.V., Direct Dialling with STD & ISD, hot and cold running water etc. Services: Travel assistance, butler service, meeting facilities, laundry service, Foreign exchange and Safe deposit locker etc. An elegant and modern building, Hotel Amar Agra offers all the comforts a modern day discerning traveler expects in his home away from home. The well-equipped conference facilities in the hotel make a business traveler's life easier. The Hotel Amar Agra boasts luxurious rooms, which offer vibrant and luxurious ambience. Each room is exquisite: there are wall to wall carpets, attached baths and round the clock cold and hot water, direct dialing facility, channel music and color Television with satellite channels and other exceptional amenities. The Noorjehan restaurant at the Hotel Amar Agra offers the guests a range of culinary possibilities including Mughali, Indian, Chinese and Continental cuisines. The Madira Bar is the place where you can have relaxation. The Hotel Amar Agra boasts a modern swimming pool where you can relax. The lawns of the hotel are perfect place to feel free. If you are a health freak, a well-equipped Health Club is there to meet your requirements. The guests can also enjoy a steam bath and the opulence of a Jacuzzi. 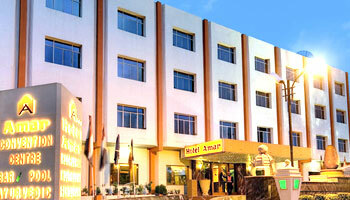 What do you think about Hotel Amar Agra? Sharich Melbourne July 5 2008:“Reasonable Hotel” Friendly greeting from a mustachio'd door man. It had a nice pool area and the dining room overlooked this. The breakfast was good and so was the service. Kerris Singapore Jun 17 2008:“Comfortable but Exorbitant Internet Charges” My son (22) and I (56) were walk-ins to Hotel Amar on the recommendation of the guy at the Indian Railways tourist office. We stayed in a first floor room just off the lobby. Upstairs rooms were unavailable due to construction. Obviously recently renovated. Hot water, clean bathroom, toilet paper, decent towels, functioning air conditioning and comfortable beds. We used the swimming pool and the water slide, both of which were well kept. The health center lacked newer equipment. Carolyn London April 28 2008:“Don't eat the chicken!” I didn't stay at this hotel, but we used the pool because our hotel's pool was being renovated. We ate lunch there the first day and my fiancee had the chicken tikka. It was obviously not cooked properly and made him very ill for the next few days. Be careful! Ana Spain Mar 9 2008:“Nice place, helpful staff” This hotel was superior to average hotel in India. Helpful staff, good breakfast, big nice room and quite good swimming pool. JKD Scotts valley CA March 5 2008:“your experience may differ depending on which room you get .....” This hotel was booked for us as part of a package tour of Rajasthan and Agra. Our first room was old and dumpy, with stained walls. The bathroom construction and fixtures were very cheap. Stayed here for two nights in early October. We were very happy with the hotel. The room was large and clean. The restaurant served good indian food and appeared to be popular among the locals. The hotel is centrally located and is a good base to explore both Agra and the Taj Mahal. The bar is a bit dark and dingy, but it is fine for a beer at the end of a days sight seeing, alternatively you can have a drink in the lobby. The facilities were good also, swimming pool, safe, internet etc.